Each year thousands of patients have their tumors genomically profiled at medical centers and clinics around the world, based on the premise that specific mutations found in the tumor will provide insight into which treatment is best for that patient. In some cases the answer is clear, based on evidence accumulated from formal clinical studies. This level of clarity, however, is available for only a handful of the hundreds of mutations found in patients’ tumors. In theory, the genomic results from these thousands of patients, if pooled together into a large registry, could provide the evidence to make treatment decisions with confidence. But this is not the current reality. Most patients’ results are trapped in isolation within the databases of the treating facility where the testing was performed. The unfortunate result is that it will take decades, if not longer, to gather sufficient evidence linking particular genotypes with clinical outcomes unless we work together. In recognition of the critical timing and need for an immediate solution to this problem, the AACR, along with seven global leaders in genomic sequencing for clinical utility—The Center For Personalized Cancer Treatment, The Netherlands; Dana-Farber Cancer Institute; Institut Gustave Roussy, France; The Sidney Kimmel Comprehensive Cancer Center At Johns Hopkins University; Memorial Sloan Kettering Cancer Center; Princess Margaret Cancer Centre, Ontario; The Vanderbilt-Ingram Cancer Center; ­and two informatics partners—Sage Bionetworks and cBioPortal—are launching the first phase of a multiphase, multiyear initiative known as AACR Project Genomics, Evidence, Neoplasia, Information, Exchange (GENIE). AACR Project GENIE aims to become a critical evidence base necessary to facilitate clinical decision making and catalyze new clinical and translational research, not only at the participating institutions, but also throughout the entire biomedical research community by ultimately making the data open to everyone following varying times of exclusive access. GENIE will accomplish this by pooling existing and ongoing Clinical Laboratory Improvement Amendments (CLIA)- and International Organization for Standardization (ISO)-certified sequencing data from the participating institutions into a single database and linking these data with select longitudinal clinical outcomes. Beyond clinical decision making, the data within the project can also be used to validate biomarkers; for drug repositioning/repurposing; to identify new therapeutic targets or biomarkers; to add new gene variants to existing therapeutic labels; and to provide the evidence base necessary to support reimbursement for next-generation sequencing by payers, among other uses conceived by the end users. Further, we envision that the shared learnings from GENIE will benefit other global consortia and vise versa. Phase I of the project is limited to the seven founding members listed above; however, there will be opportunities for other institutions to join the project in subsequent phases. Keeping in line with the themes of openness and sharing, all project governance and policies are available on the project website, and announcements of data releases and membership applications will be equally open and transparent. The key problem that GENIE is solving is a lack of evidence linking particular genetic variants to clinical outcomes. Part of this problem is that insufficient numbers of patients, particularly those with rare tumors or rare genetic variants, are seen at an individual institution to allow for statistically significant data to be generated. By aggregating the existing and future genomic data from project participants, along with some limited clinical annotation, GENIE addresses this problem. As of today, the database holds nearly 15,000 genomic records. This number will quickly grow as more patients are treated at participating institutions. In phase I, the clinical outcomes data will be obtained in response to specific clinical queries. These data will then be aggregated and linked to the appropriate genomic record, permitting the genotype-phenotype correlations to be established. This process will continue to evolve and streamline as the project moves to the later stages. In addition to making the data open to the community, we will be evaluating requests for various clinical queries and undertaking subprojects through sponsored research agreements, so stay tuned for more information about this process. There is much work ahead of us, but the launch of this precedent-setting project is the perfect moment to pause and reflect on what it took to get to this moment in time. The road here has been long; we first embarked on this project more than 18 months ago, and the concept has been in my mind for a good bit longer. Although it has taken some time to arrive here, the journey has been a great one shared with my fellow steering committee members, the various members of the task teams at each participating institution, as well as the staff at the AACR. In the not-so-distant future, it is likely that every cancer patient around the world will have their tumor genomically sequenced and their physician will use a data registry to make treatment decisions – the information will flow freely and patients will benefit rapidly. When this time comes, all involved in GENIE will know that they played a major role in making this new reality happen. 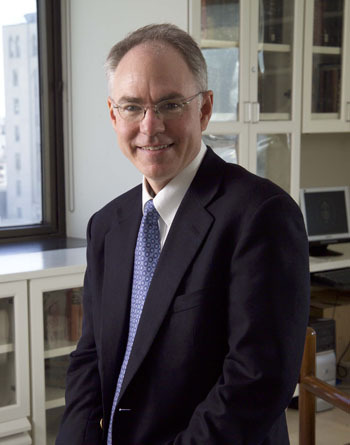 Charles L. Sawyers, MD is the AACR Project GENIE Steering Committee Chairperson and a past-president of the American Association for Cancer Research. Charles L. Sawyers, MD is the AACR Project GENIE steering committee chairperson (2015-2017), and a past-president of the American Association for Cancer Research. Dr. Sawyers is the chairperson of the Human Oncology and Pathogenesis Program at Memorial Sloan Kettering Cancer Center in New York, and a Howard Hughes Medical Institute (HHMI) investigator.